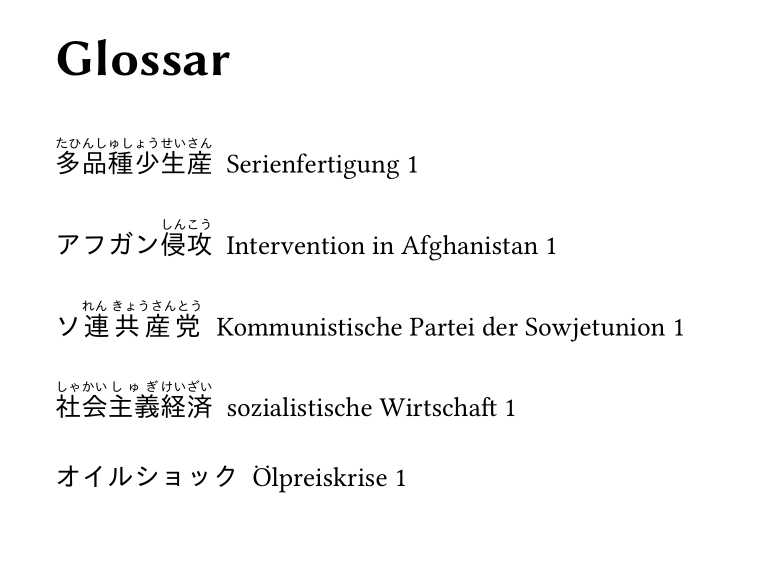 I would need a manual sorting (at least) for my glossary using glossaries package (as the glossaries-extra package doesn't work for me with CJK character (s. 2nd issue with compiling issues of bib2gls) with LuaLaTeX, because this combination is the only, that worked "somewhat". Since I am using CJK characters and the current list appears to be random to me, I would need to be able to manually change the order of the glossary (according to japanese order). Is there any way I can manually sort them with the glossaries package? Thank you! Not the answer you're looking for? Browse other questions tagged luatex glossaries cjk or ask your own question.